When it comes to paying for ads to gain more exposure for your business online, Facebook advertising is probably the easiest to use and not quite as costly as other cost per click options. Want to promote your website, latest product, upcoming event, or other web property outside of Facebook? 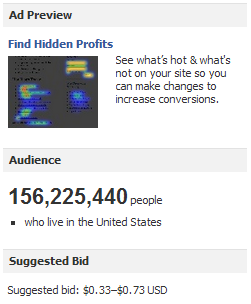 You can do that easily with Facebook Ads. Simply log in to your Facebook account and click on the Create an Ad link at the bottom of your Facebook dashboard then the green Create an Ad button to begin. 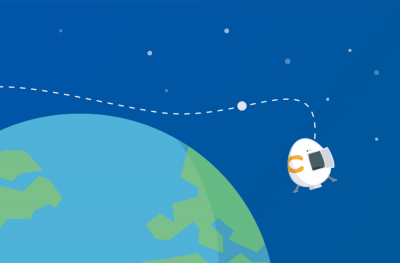 First, you will be asked to enter a Facebook destination or URL. 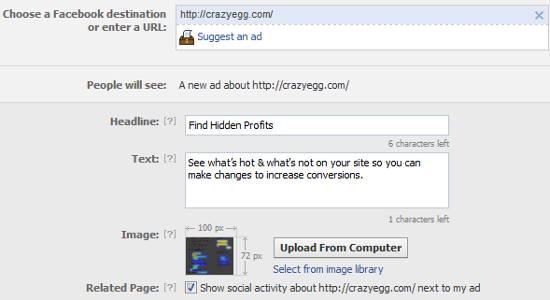 Select the Search by URL and enter the URL you would like Facebook users to go to when they click on your ad. Next, you will enter the headline, image, and text for your ad. You only have 25 characters for your headline, 90 characters for your text, and an image that is 100 px X 72 px to work with, so make it count! If you need examples to work with, you can visit the Facebook Adboard to see other ads currently on display. At the top right of your screen, you will see a preview of what your ad will look like to Facebook users along with the estimated number of users who could see your ad and suggested bid value. The latter two items will be adjusted once you choose your audience. 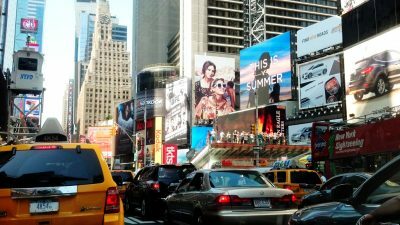 While you could show your ad to millions of people, it would be much better to choose a target audience that is more likely to purchase your products or services. First off, think about your current client demographics plus your target demographics and fine tune your ad accordingly by location, age, and gender when applicable. 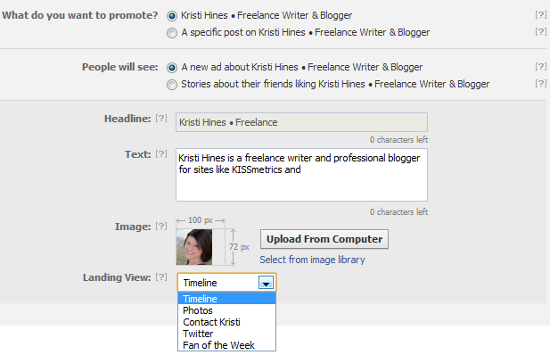 Under Precise Interests, you can enter specific keywords. Better yet, you can specify specific companies’ Facebook page fans. For example, if your company has a product that works in sync with another company’s product, you could target your ad towards fans of that product. For example, if you sell iPhone accessories, you might target only Facebook user that like the Apple iPhone Facebook page. There are also advanced targeting options that allow you to display your ad to people with a specific relationship status, those who are friends with someone who like your page, and much more. 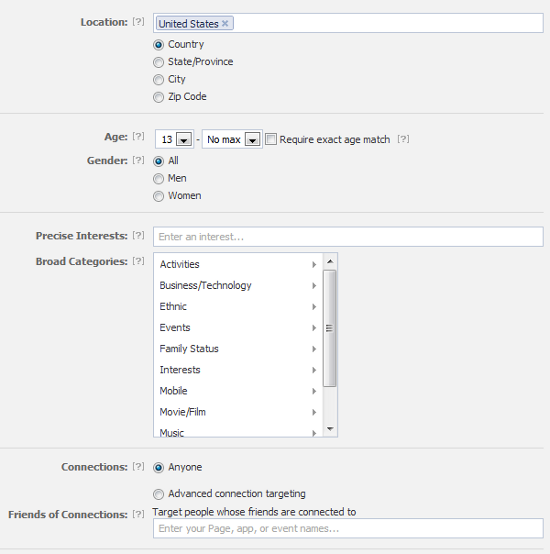 You can learn all about Ad Targeting Options in Facebook Help Center. The last thing you will need to configure is your budget. Facebook will give you a suggested bid. If two ads are targeting the same audience, the ad with the higher bid is more likely to be shown. You will also need to set your campaign schedule – uncheck the box to run your campaign continuously in order to set a start and end date. Be sure to also set your daily or lifetime campaign budget so you don’t get any surprises on your credit card statement. Once you submit your ad by clicking the Place Order button, your ad will be put through an approval process that usually takes a few hours. Then your ad will start running for your target audience for the time you have specified for the budget you have set. You can then go to your Campaign Management dashboard to see statistics for your ad, including reach, clicks, click through rate, and more. You can learn more about Facebook Advertising in Facebook for Business. The next option you have for Facebook advertising is to set up an ad for your Facebook page in order to get more likes or a specific post on your Facebook page to get more engagement. In order to set up an ad for your page or posts on your page, you will follow similar steps as setting up an ad for your website, but instead of selecting Search by URL, you will select from your business page from your Pages and Places. For Facebook pages, you can set up a custom ad that allows you to enter your own text, image, and landing view for those who click on the ad if you choose A new ad next to People will see. Alternatively, you can choose Stories about their friends liking to have an ad that simply shows Facebook users which of their friends like their page. This option will not allow you to customize your ad, but the advantage is people can like your Facebook page directly from the ad. However, it may not be a good option for pages with a small amount of fans as there may not be enough people out there with friends who like your page. 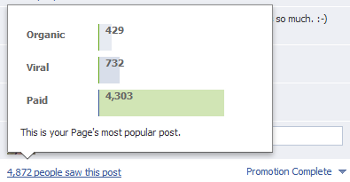 You can help increase engagement for posts on your Facebook page by setting up a Sponsored Story ad. Again, the steps are similar to those for setting up an ad for your website with exception to the ad’s destination. You will select your Facebook page as the destination, and then you will choose a specific post on your page next to What do you want to promote. You can either choose a specific post on your page or have the ad automatically use the latest post on your wall in your ad. 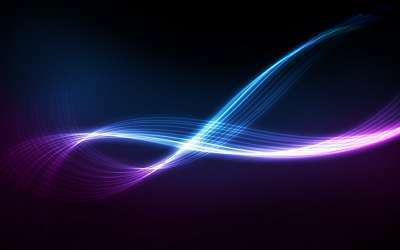 This will allow Facebook users to see your selected or most recent wall post, plus the number of likes, comments, and shares. Learn more about Sponsored Stories in the Facebook Help Center. 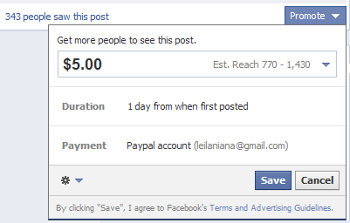 The last option for Facebook advertising comes with Promoted Posts. Promoted Posts will extend the reach of posts on your Facebook page’s wall to more people who like your page and their friends. It is only currently available to pages with more than 400 likes – if your page has less, or you want to increase visibility of your wall posts to people who are not fans of your page, Sponsored Stories is still the better option. To use Promoted Posts, simply post an update to your Facebook page’s wall, then click on the Promote link at the bottom right of the update. 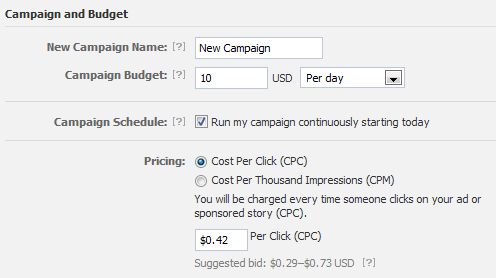 Here, you will have the option to choose a budget based on the number of people your promoted post will reach. Once your Promoted Post duration is completed, you will be able to see stats by clicking on the number of people who saw your post at the bottom of the post itself. It will show you the organic views, viral views, and paid views your post received. 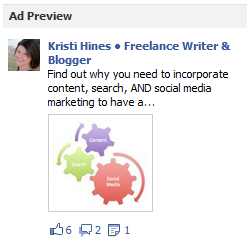 You can learn more about Promoted Posts in the Facebook Help Center. Have you used Facebook advertising to market your business? Please share your experiences and results in the comments!